The year 2011 saw little progress in the equities arena. The financial news has been discouraging. Our economy is growing, but far too slowly to put a meaningful dent in the high unemployment rate. The government’s debt load continues to swell and our elected officials seem incapable of implementing solutions. Additionally, the possibility of a further slowdown in China or of a total European meltdown adds meaningful risk to the rate of global economic growth. So, what should an investor be doing? Stock market returns have been virtually non-existent since the current century began. With interest rates now so low, it seems that there is more risk in the bond market than there is return potential. Real estate has yet to turn up. And, real earnings from sidelined cash are actually negative after taking inflation into account. In this Investment Strategy Update we offer a scenario of hope and optimism for investors. We believe the stock market lows for this cycle have already been seen, during the first quarter of 2009. While the next secular bull market in stocks may still be a few years in the future, it is definitely setting up. In the meantime, our expectation is for reasonable, though not spectacular, stock market returns, which nonetheless should be considerably better than those provided by the obvious alternatives. As always, we remind you that while we are attempting to forecast the future, our continued investment success in these volatile times will depend much more on our ability to interpret and adjust to trends and events as new information becomes available. The U.S. economic outlook is a mixed bag. On the one hand, there are some structural impediments to improved rates of growth, as well as the tail risks associated with China and Europe. On the other hand, U.S. corporations are in excellent financial condition and our economic indicators have been improving. Furthermore, there are developing trends and opportunities that could serve to boost the longer-term outlook. Working against us at the moment is the fact that with the persistent outsourcing of U.S. manufacturing in recent decades, the lack of employment growth has become structural. This lack of growth has only been exacerbated by the current combination of slow growth, rising health care costs, and tax and regulatory uncertainties that actually discourage U.S.
corporations from investing and hiring. Furthermore, the last economic downturn was financial in nature, brought about by excessive leverage and speculation in the banking, housing, and consumer sectors. Financial recessions are always followed by longer, slower economic recoveries because deleveraging has to work through the system. Private sector deleveraging is well underway in this country, but still has further to go. Also, believe it or not, we are concerned about the possibility of excessive government austerity, both domestically and abroad. It has become painfully obvious that European and other nations, including the U.S., have lived beyond their means for too long. The handwriting is on the wall and the global fixed-income markets have begun to rebel. As a result, there is a strong movement in the industrialized world towards fiscal conservatism. That is good, to an extent. However, unless fiscal austerity is countered by sufficiently easy monetary policies, the consequences will weigh heavily on the global economy. The U.S. Federal Reserve Board seems to have received that message. With business and consumer spending well below trend and the banking system still not adequately lending, a certain amount of net stimulus is required to keep the economy moving. We think it likely that there will be further monetary easing measures in our future. Hopefully, Europe’s monetary authorities will move in that direction, as well. As to the longer-term positive trends, there have been tremendous improvements during recent years in the technologies for finding and developing our energy resources. America is now the world’s largest producer of natural gas, while the production of domestic oil is increasing significantly, as well. Within a few years, if properly incented, the U.S. can move meaningfully toward energy self-sufficiency. In addition, we would note that U.S. manufacturing is currently on an upswing. In an October 2011 report, “Made in America,” the Boston Consulting Group estimated that 800,000 manufacturing jobs could be returned to the U.S. by the middle of this decade. They suggested further that each of those additional manufacturing jobs would create as many as four new supporting-job positions (e.g. restaurants, transportation, etc.). The weakening of the U.S. dollar against the currencies of some of its primary competitors has made the prices of U.S. goods more globally competitive. Transportation costs have been rising as well, as have the labor costs in China and other low-cost regions. When considering that manufacturing domestically has the advantages of excellent governance, greater reliability, and far less chance of intellectual property theft, “Made in the U.S.A.” could again become popular. While the prices of certain goods and services have been rising, the combination of a slow- growth U.S. economy, ample productive capacity, and an absence of wage pressure is hardly a recipe for system-wide inflationary pressure. Besides, continued deleveraging in the consumer, banking, and state and local government sectors is deflationary in effect, as would be any similar actions taken by the U. S. federal government. Fiscal austerity in Europe will have a further dampening effect on the global rate of inflation. But the lack of current inflation should not lull us into complacency. Food and energy prices seem destined to trend higher, long term, as a result of continuing growth in emerging market demand. Also, longer term, the Fed’s ultra-loose monetary policy could well result in a too-much-money-chasing-too-few-goods scenario. An expansionary monetary policy is necessary for now, but one can only hope that down the road, after the economy has started to re-accelerate, actions will be taken to drain excess liquidity from the system. If not, inflationary pressures inevitably will rise, but that is almost certainly more than a year away. Interest rates are currently near their lowest levels in history. Economic growth is quite slow, but rates can’t really go that much lower. And slowly but surely the deleveraging process will come to an end, the economy will regain vigor, and interest rates will begin to normalize. It is difficult to anticipate the timing of the normalization process, however we would not be surprised to see a 3% 10-year Treasury rate, versus the roughly 2% current level, sometime during the next year or two, with a strong possibility of still higher interest rates beyond that. Thus, we view the current U.S. bond market risk/reward tradeoff as highly unattractive. Over recent years, large numbers of investors have sought protection by investing in the bond market. We fear that trend will end badly. Eventually interest rates will rise to a more attractive investment level, but for now we continue to maintain a short-maturity structure in our fixed income portfolios. We are also strongly emphasizing quality, as today’s yields seem insufficient to justify much credit risk. In broad terms, stock market returns consist of earnings growth, dividend yield, and changes in valuation. On three occasions during the last 100 years, those factors have combined in such a way that stocks have experienced volatile multiyear trading ranges. These included the 26 years surrounding the Great Depression – around Dow 100; for 16 years from 1966 to 1982 – close to Dow 1,000; and currently since 1999 – near the Dow 10,000 level. A common element in all of those periods was the fact that each began with elevated investor expectations and very high valuations. For the most part, corporate earnings grew during those range-bound periods, but fears of economic weakness, deflation, or inflation (during the 1970s) caused valuations to trend steadily lower. 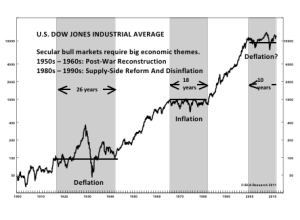 Both of the previous episodes were eventually followed by a prolonged stock market advance – note, for instance, the 1950s/1960s and the 1980s/1990s, each of which was driven by the profit potential and productivity enhancements that came with new technologies (e.g, automobiles, air transport, electronics, and computing). It is interesting to note that while technological innovation tends to occur in a relatively straight line, the adoption of those innovations is typically suppressed during good economic times. Capital remains focused on what is currently producing profits and, once employed, labor does not move that easily. But during more difficult economic times such innovations are pushed forward and, eventually, gain the critical mass needed to impact profits, productivity, and investor expectations going forward. Now consider these cycles in terms of our current situation. Stock market valuations have contracted by more than half since the technology bubble of the late 1990s. The U.S. economy has labored, overall, but the balance sheets of Corporate America are in great shape, and earnings have been growing. S&P 500 operating earnings in 1999 were $51.68. For 2011, these earnings should come in close to $97.50. In addition, meaningful new technologies such as mobile computing, cloud computing, and social networking have been gaining momentum. And with the continuing development of the less-industrialized world, an estimated 500 million people will be added to the world’s middle classes over the next few years, boosting global consumption accordingly. Thus, we believe that we are well on the way to setting up the next secular bull market, but we are probably not ready yet. In the meantime, the stock market remains captive to evolving news events. The current environment of extreme volatility seems likely to continue. While investor time horizons have become increasingly short, we think this is an ideal time to be focused on longer-term opportunities. Increasing global consumption will include goods and services, as well as commodities, such as clean water, food, and energy – at least some of which are also likely to be in increasingly short supply. We are also selectively attracted to companies active in the evolving technologies that will combine to drive the next wave of profit growth. Our current preference is to overweight high-quality U.S. domestic stocks, particularly those that have meaningful and growing dividend yields. America is still a great nation – industrious, entrepreneurial, open, and caring. As a nation, we have a plethora of positive qualities. Many of these were well summarized in a quote from management consultant Byron Auguste: “youth, openness, dynamism… unparalleled institutions of innovation… democracy… high social trust, low corruption, and an historic link between effort and achievement.” In addition, we are blessed with abundant natural resources. Unfortunately, in several respects we have lost our way. This has happened over time, as it has in the past with all great societies. As a nation, there is a delicate balance between creating and caring, and complex choices have to be made which will determine whether we will regain our competiveness or continue the slide into mediocrity. Our current political rhetoric and regulatory environment seem to encourage productive people to hold off on the sort of wealth creation that spurs the economy and creates jobs. We have too much debt, a deteriorating infrastructure, growing income inequality, and health care and education systems that accomplish too little for the money spent. In addition, we lack leadership. These problems have evolved over many years and did not just arise during the current or even the last two administrations. We strongly believe that our problems are fixable and that we have the means to make our system work. It isn’t about politics. We require leadership, focus, and a national effort to restore competitiveness. As a wealthy nation, we can afford to embrace the non-economic aspects of greater social and environmental responsibility, but only as long as we also foster growth and development. We have to bring manufacturing back to the U.S. We must incent and reward excellence, reduce regulatory complexity, and modernize our educational system. The solutions to our shortcomings do not require a lot of government spending, because more spending will not fix the problems. Neither will austerity alone. America’s budget deficit results from the fact that we spend too much and take in too little. At 15% of GDP, the current level of federal taxes is the lowest in 60 years. Spending has to be cut and revenue has to be raised. The Bowles-Simpson Commission had it about right, in our opinion. Investors have much to worry about, but there are definite signs of progress. As recently as a few months ago, there were three major concerns: was the U.S. headed for a double-dip recession? Would the Chinese economic slowdown result in a hard landing? And, would Europe completely implode? More recently, some of these concerns have eased. The U.S. economy has firmed. Our base case outlook is that, in the absence of a severe shock, our economy will continue on its current, slow-growth path. While lingering concerns remain regarding China’s economy, we hold the opinion that its policymakers have room to maneuver and should be able to successfully navigate a soft landing. Recent indications are that the Chinese government will soon take action to stimulate its economy. As for Europe, the day of reckoning is upon it. European governments refused to address their problems, so the financial markets have forced the issue (U.S. policymakers take note). Whatever the outcome, a European recession is likely in 2012 and its citizens seem sure to suffer a painful reduction in their standard of living. Regarding investments, there is little in the way of attractive alternatives to stocks. With interest rates so low, the normally safer fixed-income markets do not seem all that safe. Unless the level of U.S. government debt is purposefully lowered, the markets will inevitably force the issue here, as well. One way or another, U.S. interest rates will eventually rise. We recognize that the shorter-term investment environment is highly uncertain, with continuing systemic risks. Volatility is likely to persist, and stock market valuations could become still cheaper before the next secular upturn. Thus, we remain conservative in our stock selection and overall asset allocation. Yet we also find reasons to be optimistic. A substantial part of this country’s present difficulties have already been discounted by the current low level of stock market valuations. U.S. companies are in excellent financial condition and should be able to grow earnings in line with an expanding global economy. Many sell at reasonable valuations, with current dividend yields that exceed the interest-income yields provided by high quality bonds, sometimes from the very same issuer. We expect reasonable total returns during the coming year – meaning attractive dividend yields plus moderate capital growth. This nation is learning the hard way that expanding government does not build new businesses or create long-run economic activity. Healthy businesses, not governments, create jobs. We are a great and resourceful people, but this is undoubtedly a critical time in the history of our nation. Our incentives must be properly aligned. To BTR’s way of thinking, neither the political left nor the right speaks for the majority of Americans. We need a government that will work together for the common good. If our current set of politicians will not do so, then it is time to elect some that will. As a final note, we wish all of our friends and clients peace, joy, health, and prosperity in the New Year and for many years to come.